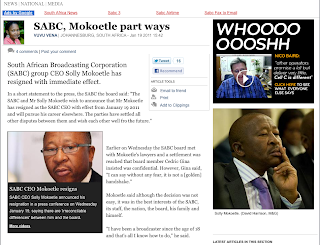 South African Broadcasting Corporation (SABC) group CEO Solly Mokoetle has resigned with immediate effect. Earlier on Wednesday the SABC board met with Mokoetle's lawyers and a settlement was reached that board member Cedric Gina insisted was confidential. However, Gina said, "I can say without any fear, it is not a [golden] handshake." Mokoetle said although the decision was not easy, it was in the best interests of the SABC, its staff, the nation, the board, his family and himself. "I have been a broadcaster since the age of 18 and that's all I know how to do," he said. The rest of the saga has been reported here and here. And for those with speedy broadband, you can even view it on video.